The Odakyu Group started a “2019 Lunar New Year Campaign” from Wednesday, January 16, to Friday, February 15, 2019. 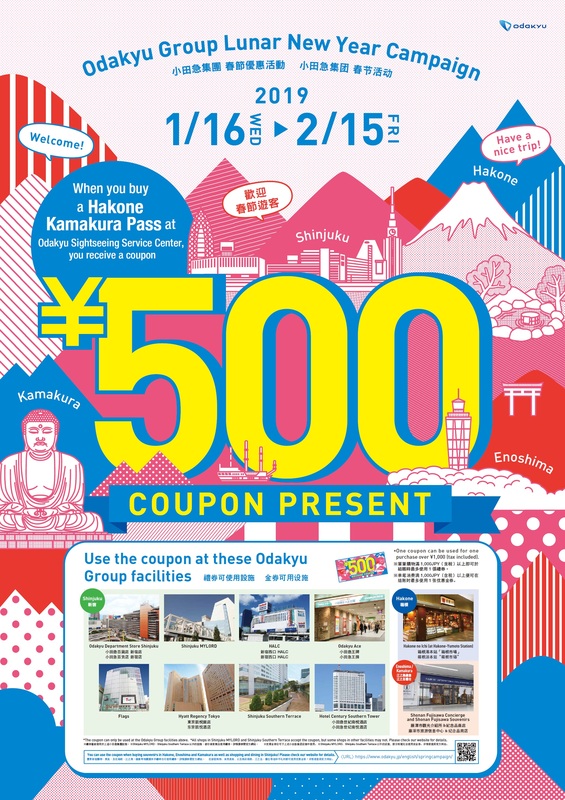 As part of the campaign, the Odakyu Group presents qualified travelers with coupons worth 500 yen each -- which can be used in Tokyo’s Shinjuku district popular among travelers from abroad as well as in the Hakone, Enoshima and Kamakura districts -- popular tourist spots along the Odakyu railway lines -- and offers special goods aboard Limited Express Romancecar trains exclusively during the Lunar New Year period. Companies belonging to the Odakyu Group are joining hands in welcoming inbound tourists such as by wearing special “hospitality” badges. The Odakyu Sightseeing Service Center Shinjuku West and the Odakyu Sightseeing Service Center Shinjuku South, tourist information centers for foreign tourists, offer a 500-yen coupon that can be used at designated Odakyu Group facilities to each of customers who purchase the “Hakone Kamakura Pass,” a 6,500-yen excursion ticket exclusively for inbound tourists. Coupons are offered on a first-come-first-served basis, and their distributions end once they run out. Shinjuku area: Odakyu Department Store Shinjuku, HALC, Shinjuku MYLORD, Flags, Odakyu Ace, Shinjuku Southern Terrace, Hotel Century Southern Tower, Hyatt Regency Tokyo. Enoshima-Kamakura area: Shonan Fujisawa Concierge and Shonan Fujisawa Souvenirs at Fujisawa Station. A “Japanese Sweets Set,” filled with charms along the Odakyu lines, is sold aboard Limited Express Romancecar trains during this campaign for 1,000 yen including tax. The set consists of Japanese sweets produced along the Odakyu lines, special chopsticks and a towel, among other items. The Odakyu Group hopes that the set is a good souvenir for inbound tourists. Staff members at Odakyu railway stations and in the Enoshima and Hakone areas each wear an “Omotenashi (hospitality) Badge” bearing messages such as “Have a nice trip” in six languages. Odawara and Hakone-Yumoto stations are decorated for the Lunar New Year to welcome inbound tourists. Odakyu Electric Railway, established in 1948, is one of Japan’s major private railway companies. With the “Shinjuku” central transportation terminal in the capital of Japan, Odakyu lines extend to “Hakone,” one of Japan’s foremost hot spring tourist destinations, and “Enoshima-Kamakura,” the historical seaside town close to the city center, and they are used not only for sightseeing but also by two million commuters traveling to work every day. In addition to transportation, Odakyu conducts a variety of other businesses, primarily in the Tokyo and Kanagawa areas, such as department stores, supermarkets, real estate, hotels and restaurants.